In mammals, body energy expenditure decreases with caloric restriction as well as prolonged starvation. This is an adaptive response driven by the hypothalamus that includes behavioral as well as metabolic modifications. During fasting, the hormonal milieu is dominated by low levels of insulin and thyroid hormones, which might explain the slow-down in weight loss after a few days of caloric restriction. Thyroidal activity is restored promptly upon normalization of caloric intake as seen in patients recovering from anorexia nervosa. In such patients, weight gain and the rise in serum T3 are closely associated with acceleration in energy expenditure. These observations indicate that the hypothalamic-pituitary-thyroid (HPT) axis is affected by nutrient availability, with the lowest (default) levels of activity seen during caloric restriction. Leptin is the key molecule signaling food intake and the availability of energy substrates, which activates the HPT axis by stimulating secretion of TRH and TSH, and hence thyroidal activity. 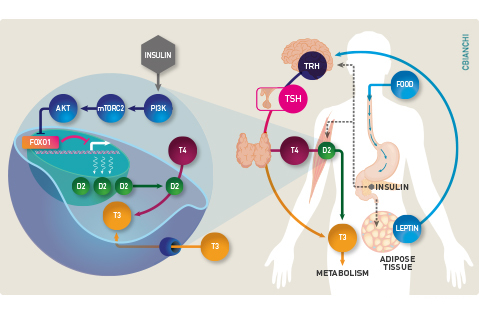 In humans, the thyroid gland contributes little with the daily T3 production, with the bulk of T3 being produced by two deiodinases that convert T4 to T3 outside the thyroid parenchyma, i.e. D1 and D2. Of course there is a drop in serum T3 levels with the decrease in thyroidal activity in fasting. In addition, there is also accelerated thyroid hormone inactivation via D3 expression in multiple tissues, as well as accelerated sulfation and glucuronidation in the liver. Only recently it became clear that the extrathyroidal T3 production via D2 is also reduced by caloric restriction. That hepatic D1 activity is also reduced during fasting was known, but this is the consequence rather than a cause of the low serum T3 given that Dio1 is highly responsive to T3. In contrast, D2’s response to fasting reveals a whole new set mechanisms regulating thyroid hormone activation. Much of these new mechanisms was discovered in a cell models. Caloric restriction can be mimic by shifting cells to media containing only 0.1% FBS, which reduces Dio2 expression via FOXO1-mediated transcriptional repression. This FOXO1 binding site is within the DIO2 promoter, close to the transcription start site. Binding of FOXO1 to this site, suppresses DIO2 gene expression. 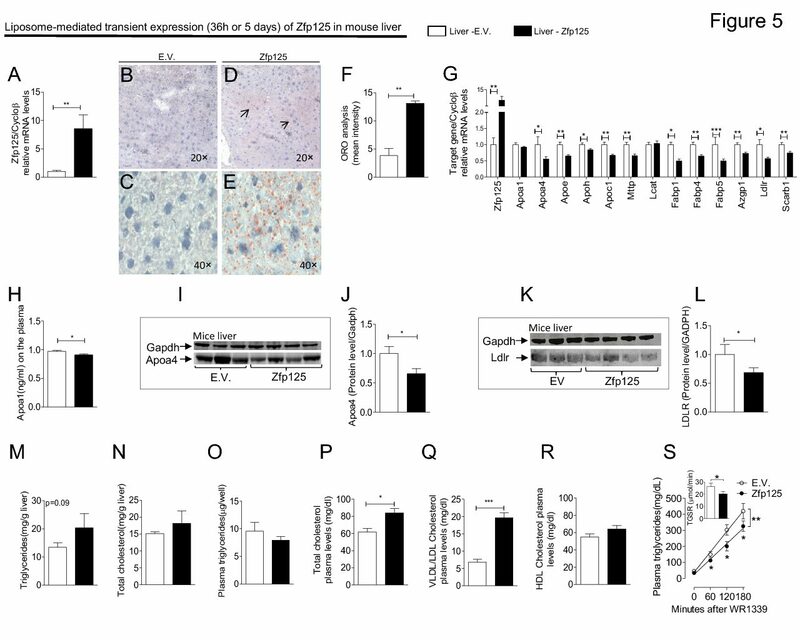 In contrast, shifting cells back to a media containing 10% FBS (after 24h of fasting) increases Dio2 expression and D2 activity through a mechanism initiated by insulin and mediated by a series of kinases (PI3K-mTORC2-Akt) that end up phosphorylating FOXO1, relieving DIO2 repression. These findings explain the observation in humans that fasting is associated with a reduction in skeletal muscle D2 activity that is partially prevented by insulin administration. That extrathyroidal T3 production is reduced during caloric restriction constitutes a new aspect of the overarching homeostatic mechanism to adjust thyroid hormone signaling to the appropriate level of energy substrates: thyroidal activity and serum T3 levels are kept at a minimum (de-fault) during fasting or severe caloric restriction, and both increase as food becomes available. The clinical implications are many. For example, hypothyroid patients maintained on levothyroxine depend on D2 for more than 80% of all their T3 needs, thus they are at much greater risk to develop low serum T3 during caloric restriction. Same with diabetic patients that might suffer from insulin deficiency or resistance to insulin action.